Earlier this year, Jeep unveiled the refreshed Renegade in Europe, and now, the automaker has released details about the U.S.-spec model. While the car offers changes inside and outside, the most prominent and exciting changes come under the hood. Continue reading to find out. Another day, another piece of news about a new crossover. This time, Jeep takes its turn in the spotlight with plans to launch a new model that would sit below the Renegade, making it Jeep’s new entry-level offering. Word of this development comes from Jeep CEO Mike Manley, who admitted that the prospect of an even smaller car than the Renegade is an appealing proposition, especially in markets like Europe and Latin America. Jeep CEO Mike Manley wasn’t coy or evasive about it. When asked about Jeep’s plans, Manley gave as direct an answer as he could give. “A smaller car than the Renegade is very interesting to us, and we are actively looking at the project now,” he said. If you’re concerned about Jeep flooding the market with SUVs, don’t be. Manley explained that if a new baby Jeep were to arrive, it would only be sold in specific markets, specifically Europe and Latin America. “We’ve seen the general move in Europe towards smaller SUVs, and there could also be a market in Latin America,” he noted. The observation has weight to it because crossovers have become the rage in those two markets. Having an entry-level Jeep in those places could help bolster Jeep’s brand in places where it doesn’t hold as big of a market sway as it does in the U.S. and China. 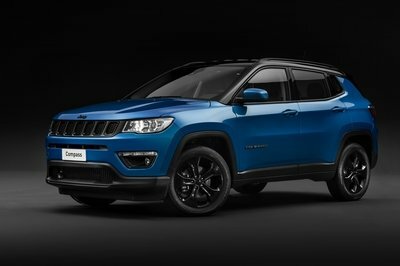 Speaking of which, if Jeep decides to give the thumbs-up on the project, don’t expect it to be sold in China, regardless of how big the crossover and SUV market is there. Apparently, a baby Jeep would hold a distinct disadvantage because the demand for crossovers and small SUVs in the country are focused more on local brands and manufacturers that offer strong value and cheaper costs. Previous reports also indicated that a baby Jeep to sit below the Wrangler is out of the question in the U.S. 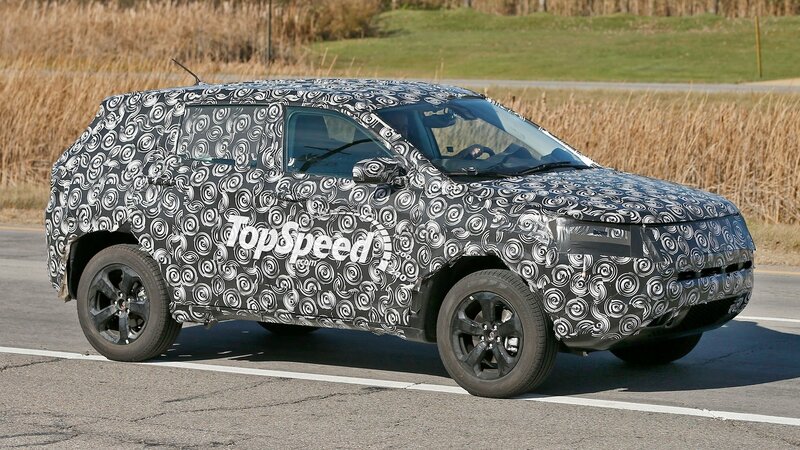 Regardless of where it ends up, the new entry-level Jeep will more than likely use the same architecture that is used in the next-generation Fiat Panda. Should that be the case, the most likely scenario would see Jeep develop its own body and interior and place on top of the same running gear that the Panda has. As little as we know now, everything will come to light on June 1, 2018. That’s when FCA chief Sergio Marchionne will announce the five-year plans for each of FCA’s brands, including Jeep. Who knows, we might even hear the man talk about the next-generation Patriot. Read our full speculative review on the 2019 Jeep C-Segment CUV. Read our full review on the 2019 Jeep Renegade. Introduced in 2014, the Jeep Renegade was received with some skepticism, mostly for being based on a Fiat platform and for being built outside the United States. But the company’s smallest SUV yet became a popular choice in its first three years on the market, with nearly 250,000 units sold in the U.S. and more than 470,000 examples delivered worldwide. The Renegade is close to receiving its mid-cycle update in 2018, but until that happens, Jeep gave the mini SUV a makeover for the Moab Easter Safari. 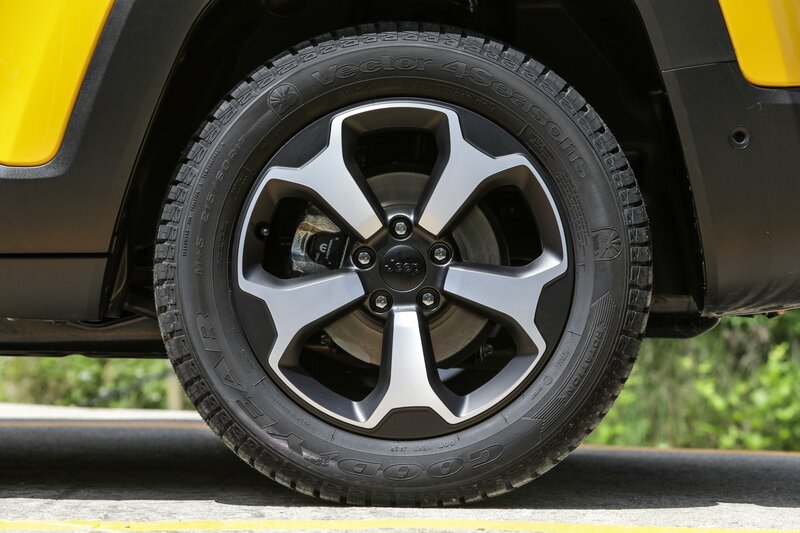 It’s called the B-Ute and is equipped for the ultimate off-road adventure. Fitted with a series of Jeep Performance Parts, the B-Ute would slot above the Trailhawk model in the lineup if it were to become a production model. It has more rugged features, bespoke interior parts, and enhanced off-roading capability thanks to a lift kit and larger wheels and tires. The name itself is a bit weird, as it combines the letter “B” with the term used for utility vehicles in Australian. Read together, and it would seem like Jeep wanted to call this SUV “beauty.” And it’s certainly not! But hey, it was built to tackle rough terrain and not win beauty contests, so it doesn’t really matter. Continue reading to learn more about the Jeep B-Ute. If you’re familiar with the Jeep Renegade, it won’t take you long to notice why the B-Ute is different. The 17-inch wheels wrapped in off-road tires and the Jeep Performance Parts roof rack are obvious giveaways. But the B-Ute also sports a unique front fascia with a more rugged bumper. The foglamps in the corners are gone, while the vent in the middle is thinner. The entire bumper is actually smaller in order to help the B-Ute climb rocks easier. The grille remains unchanged, but the chrome on the vertical slats was blacked-out, a feature we’ve seen on the Renegade Trailhawk. 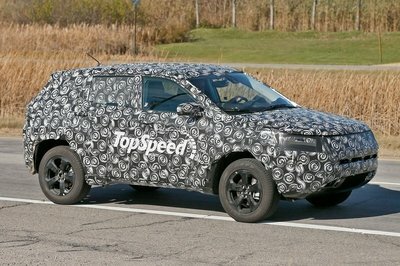 The SUV also gained a new engine hood with heat extractors and beefed-up fender flares. A modified rear bumper, a “B-Ute” badge, and Jeep Performance Parts rock rails round out the vehicle’s bespoke exterior. The cabin gets a few interesting extras too, starting with the custom-trimmed seats with Mineral inserts. There’s also a Carbonite finish on the gear shifter, spears, and A/C vent surrounds, and Piano Black trim. Jeep also added all-weather floor mats from Mopar and a MOLLE system on the back of the front seats. The latter is an acronym for Modular Lightweight Load-carrying Equipment and define the current generation of load-bearing equipment and backpacks used by a number of NATO armed forces. Under-the-skin upgrades are limited to just a 1.5-inch lift kit, but it’s enough to turn the Renegade into a more capable off-road vehicle, especially when combined with the BF Goodrich T/A Baja Champion tires. Power comes from a 2.4-liter Tigershark engine, which generates 180 horsepower. The output is identical to the standard model, but it’s more than enough to move this little crossover around. 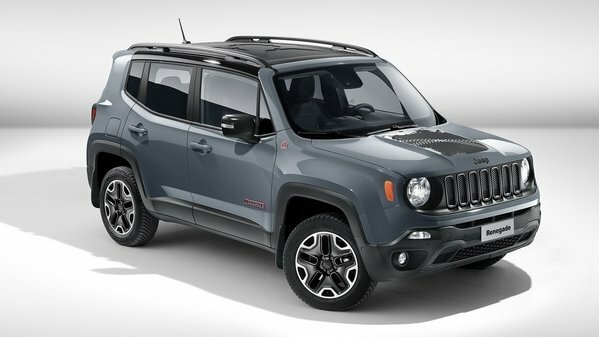 Just like in the regular Renegade, it mates to a nine-speed automatic transmission. Read our full review on the 2017 Jeep Renegade. The cute-ute Jeep Renegade is getting its first mid-cycle refresh. 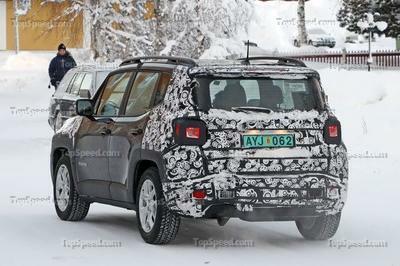 Spy photographers spotted a camouflaged Renegade winter testing in Europe along side the euro-spec Wrangler JL and some Alfa Romeo products. 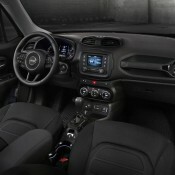 The changes are confined to the Renegade’s front and rear fascias, along with tweaks to the dashboard. Changes to the drivetrain will likely be limited to a new nine-speed automatic transmission and updated Active Drive 4WD system, both courtesy of the updated 2019 Cherokee. Jeep could even include its new 2.0-liter turbocharged four-cylinder, though at 270 horsepower and 295 pound-feet of torque, is a big jump over the for the 2.4-liter Tigershark four-cylinder and its 180 horses and 175 pound-feet. The power would certainly be welcomed, though. Jeep is expected to debut the updated Renegade sometime in 2018 ahead of the 2019 model year. Continue reading for more on the refreshed Jeep Renegade. Like any modern mid-cycle refresh, the front fascia receives the bulk of changes. Though the camo we can see an updated grille, repositioned fog lights, and new turn signals. The grille features less dead space between the seven-slotted opening. 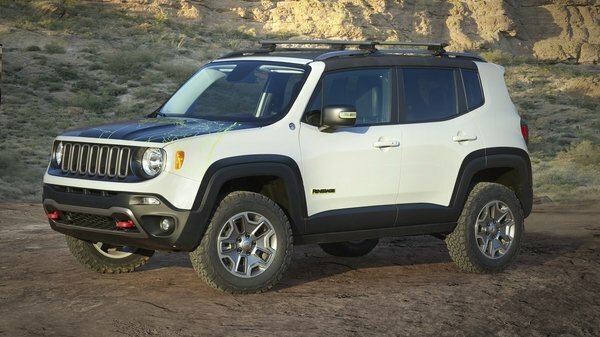 Chrome trim surrounds the slots, too, likely offering a slightly more up-scale feel to the Renegade’s playful design. The fog lights are now located more inboard, alighting right under the screw-in recovery loop. The placement means this test mule is most certainly a non-Trailhawk model that doesn’t feature the prominent red tow hooks. The bumper-mounted turn signals are now shorter and wider than before. They also appear to be LED. 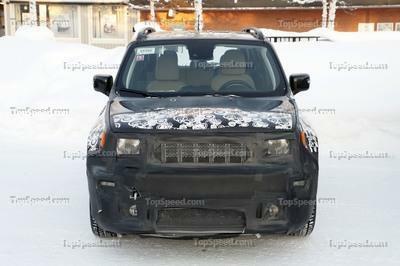 Our spy photographer says the new Renegade will be offered with optional LED headlights, too. 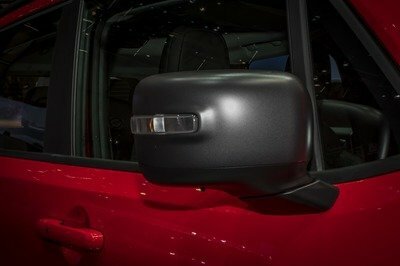 Our guess is they’ll look like the new Wrangler JL’s premium LED units. Around back, it’s hard to tell any differences between the test mule and current Renegade. About the only noticeable change are the taillights, which have larger white portions in the center than current Renegade’s X-shaped taillights. It could just be the camera angle, too. 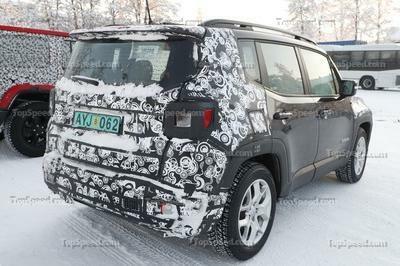 The rear bumper also confirms this test mule isn’t the Trailhawk model since the red rear tow hook isn’t present. Lastly, the Renegade appears unchanged in the middle. The doors, roof, and middle portions of the wheel wells are uncovered. Our spy photographer wasn’t able to grab shots of the interior, but said the dash features a new, larger infotainment system and updated HVAC controls. While we’re pretty sure the Renegade won’t be getting the 2019 Ram 1500’s 12-inch Uconnect system, we do expect Jeep to upgrade the Renegade’s interface. Currently, the Renegade comes standard with a 5.0-inch Uconnect screen and an optional 6.5-inch unit. We’d wager the 7.0-inch will now be the default system and the 8.4-inch Uconnect will be the premium choice. The latest Uconnect 4 software will be present, too. 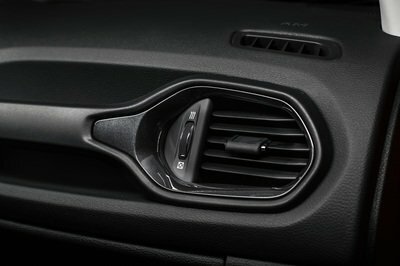 As for the HVAC controls, we’re not sure what more Jeep can do beside shake up the design. 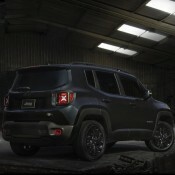 The Renegade is already available with an automatic dual-zone system in higher trims. Perhaps a new dual-zone system will be standard across the board. We’re also expecting an updated connectivity base with more USB ports, including USB-C connectivity. Jeep might even throw in a wireless phone charger. Otherwise, the updated Renegade will continue seating five people over its two row, while holding 18.5 cubic feet of stuff behind the second row. Folding the 60/40-split second-row bench opens the cargo capacity to 50.8 cubic feet of storage. 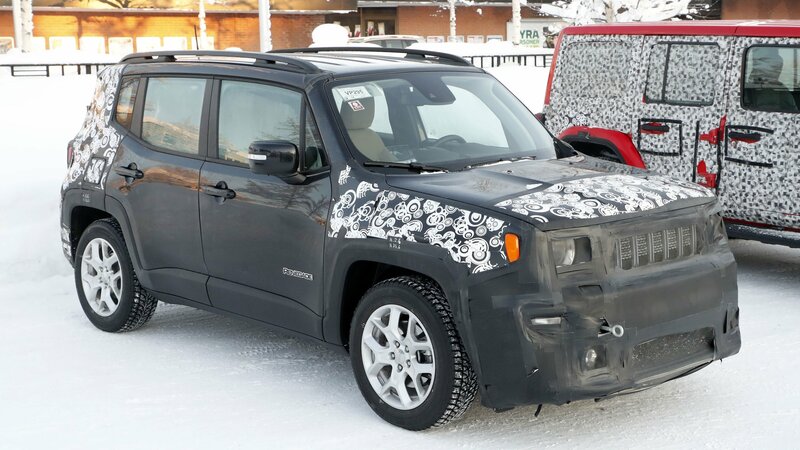 We expect Jeep to update the 2019 Renegade’s transmission and 4WD systems. The engines, however, are likely to carry over mostly unchanged. The base 1.4-liter MultiAir is a naturally aspirated four-cylinder making a trepid 160 horsepower and 184 pound-feet of toque. A six-speed manual and nine-speed automatic are the two transmission choices. Fuel economy maxes out at 24 mpg city and 31 mpg highway. The optional 2.4-liter Tigershark MultiAir 2 engine is also naturally aspirated but makes slightly more power at 180 horses and 175 pound-feet of torque. This engine is only offered on 4WD models and pairs exclusively to the nine-speed automatic. Fuel economy is slightly less than the smaller engine, but not by much. The 2.4-liter is EPA-estimated at 22 mpg city and 30 mpg highway. 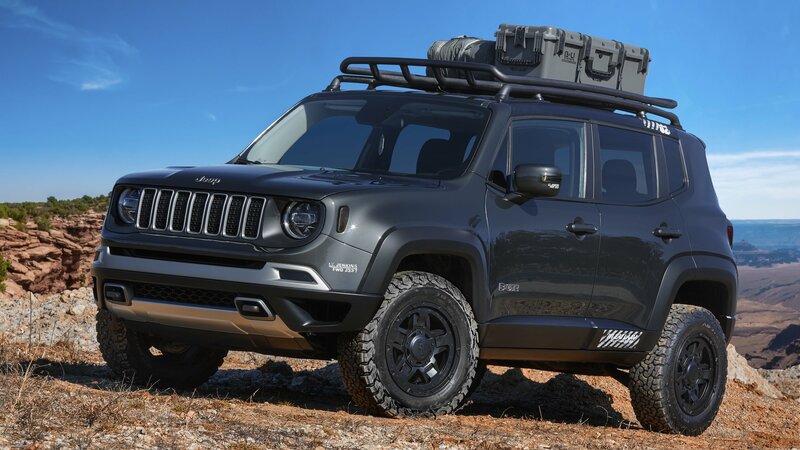 As for the big updates, we expect the new Renegade to receive the 2019 Cherokee’s updated nine-speed automatic. Jeep says that transmission provides smoother shifts thanks to a reprogrammed computer control module. Also likely borrowed from the updated Cherokee is the new Active Drive I 4WD system. The new AD I system have been completely reworked and is 17 pounds lighter and has 50 percent less internal friction at low speeds than before. Between the new Active Drive I and nine-speed auto, the updated Renegade should return better fuel economy numbers, regardless of what engine it has. 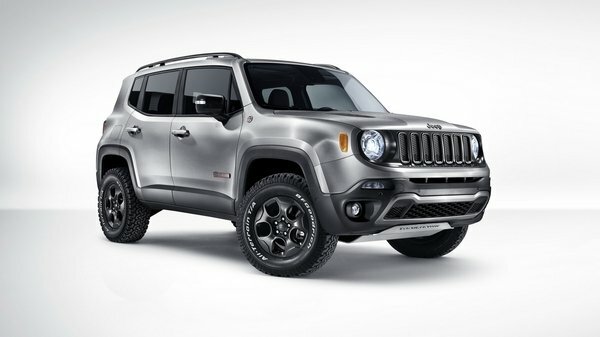 The Renegade Trailhawk will continue using the Active Drive Lock 4WD system. This setup includes a low range for low-speed crawling and a locking rear differential. The Trailhawk also boasts beefier all-terrain tires, a 0.8-inch suspension lift, and unique bodywork that improved approach and departure angles, as well as accommodates the distinctive red tow hooks the Trailhawk trim is known for. The Jeep Renegade competes in a highly competitive market segment, so we’re not expecting Jeep to drastically inflate its prices beyond a couple hundred dollars on each trim level. The 2017 Renegade Sport in FWD starts at $17,995. For $2,000 more, 4WD can be had. Above the base Sport trim is the Latitude, Altitude, Limited, and Trailhawk. The “trail-rated” Trailhawk starts at $26,895 and tops out around $30,000 with extra options. 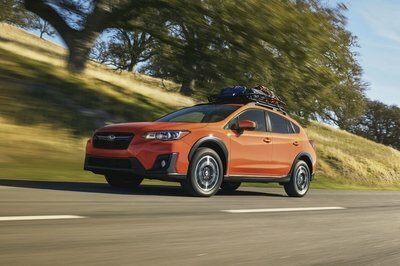 Subaru offers something for the adventurous types, too – the XV Crosstrek. This lifted Impreza wagon has an impressive 8.7 inches of ground clearance and standard AWD. It even comes standard with a six-speed manual transmission. The Crosstrek offers a car-like driving feel while being completely at home in adverse weather condition and on unpaved trails. Power comes from Subaru’s 2.0-liter Boxer four-cylinder making 152 horsepower and 145 pound-feet of torque. 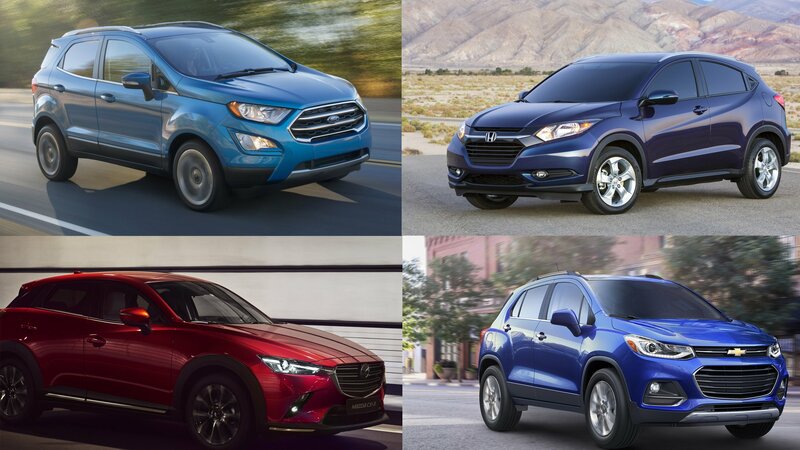 While the six-speed is standard and more fun, upgrading to a higher trim level means a Continuously Variable Transmission is the only choice. Regardless of transmission, the Subaru isn’t fast or particularly sporty, but neither is the Renegade. Pricing for the 2018 Subaru Crosstrek starts at $21,795 for the 2.0i trim. The mid-grade Premium trim carries a $22,595 sticker price and the range-topping limited starts at $26,295. The 2018 Mitsubishi Outlander Sport continues in the same outdoorsy, sporty vibe established by the Jeep Renegade and Subaru Crosstrek. The Outlander Sport seats five, offers descent ground clearance and short overhangs, and comes with FWD or an optional AWD system. The standard powertrain is a 2.0-liter four-cylinder making 148 horsepower and 145 pound-feet of torque. A five-speed manual is standard, but a CVT will be more widely available. Optionally, a 2.4-liter four-cylinder makes 168 horses and 167 pound-feet. Unfortunately, it’s only available with the CVT. Both engines come standard with FWD and have the option of AWD. Even the manual can be paired with FWD or AWD. Pricing begins at $20,395 for the ES trim. Adding the CVT moves the sticker to $21,595 and AWD to $23,095. Prices span up to $25,995 for the range-topping SEL trim with the 2.4-liter. 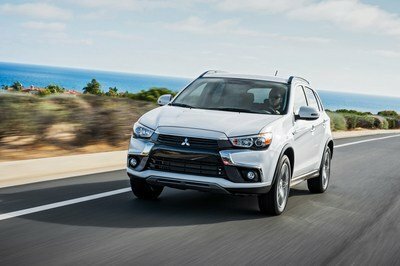 Read our full review on the 2018 Mitsubishi Outlander Sport. 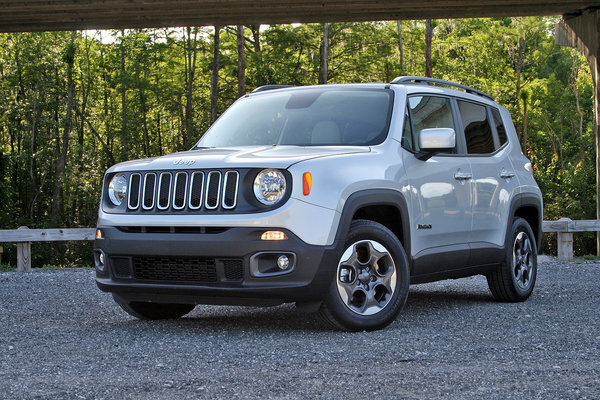 The Renegade has proven itself a valuable member of the Jeep lineup thanks to its hot sales. 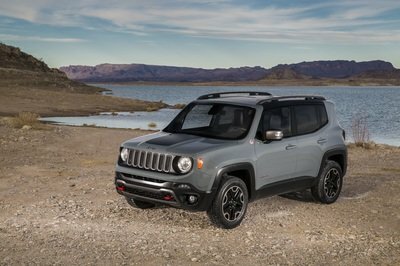 Its cuteness aside, the little Renegade is actually the most off-road capable compact crossover among its competitors when fitted with the Trailhawk trim. 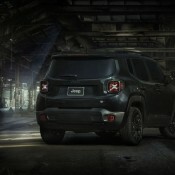 The visual updates for 2019 should help the Renegade remain a top choice for crossover shoppers. We just can’t wait to hear the official details about powertrain and infotainment improvements. 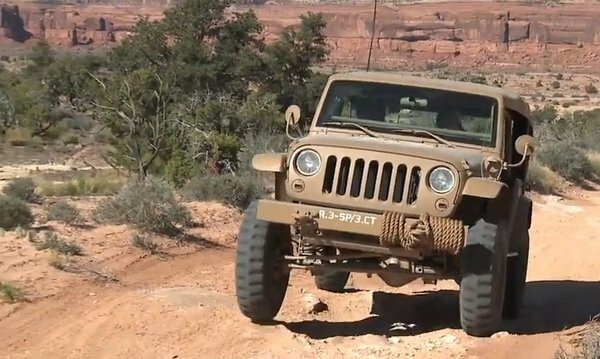 The 50th annual Moab Easter Jeep Safari is coming up with a quickness, and Jeep has put together a number of functional concepts to bring to the party. Some are more interesting and more in-depth than others, but each and every one is special in its own way. Today I’m taking a look at the Jeep Renegade Commander Concept, and while it isn’t as crazy as the Jeep Trailcat Concept or as iconic as the Jeep Crew Chief 715, it does offer its own unique features that are well worth talking about. Jeep and Mopar have been teaming up to build functional concepts for the Easter Jeep Safari since 2002, using a range of Mopar Performance Parts, and some custom parts to get the job done. Unlike some of the concepts, this Renegade Commander Concept could be replicated pretty easily if it was really something you wanted to take the time to do – a lot easier than the Trailcat Concept anyway. As you would expect, this concept features a number of different add-ons to make it more worthy of off-roading, but Jeep and Mopar didn’t go overboard on this one. Of course, the Renegade wasn’t that bad for off-roading to begin with, but the features we’re about to discuss makes it that much better. Surely this model will be a blast on the trails in Moab, Utah this year. 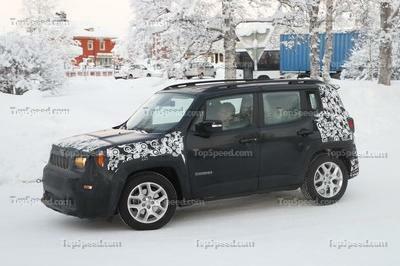 Continue reading to learn more about the Jeep Renegade Commander Concept. 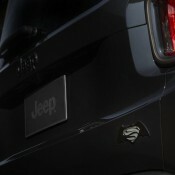 As part of their joint marketing campaign with Warner Bros. Pictures, Fiat-Chrysler released a special edition version of the Jeep Renegade that marks the premiere of the highly anticipated Batman v Superman. The car is called – you guessed it – Jeep Renegade Dawn of Justice edition. Granted, the car they’ve picked for this treatment is not very heroic, but at least it comes with a good amount of exclusive visual features and equipment. The $26,250 Jeep Renegade Dawn of Justice edition boasts Carbon Black exterior paint, 18-inch Gloss Black wheels and Gloss Black accents around the exterior. You can also order a Granite Crystal paint job with a two-tone Gloss Black roof. Either way, the car is distinguished by exclusive exterior badging. 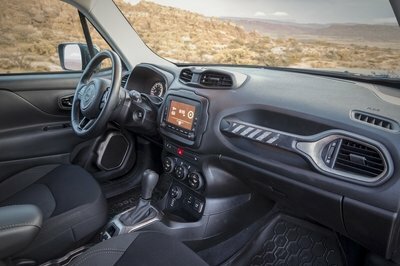 Inside the cabin Jeep Renegade Dawn of Justice features black premium cloth seats and High Gloss Black finishes, as well as Metal Diamond accents on the shifter knob and door handles. Equipment-wise, the special edition is based on the Latitude 4×4 and comes standard with a 2.4-liter Tigershark engine with MultiAir2, nine-speed automatic transmission, Jeep Active Drive 4×4, Selec-Terrain, ParkSense rear backup camera, remote start, power driver’s seat and dual-zone automatic temperature control. Too bad most of the Batman v Superman: Dawn of Justice movie are either too young to drive or too broke to afford one. 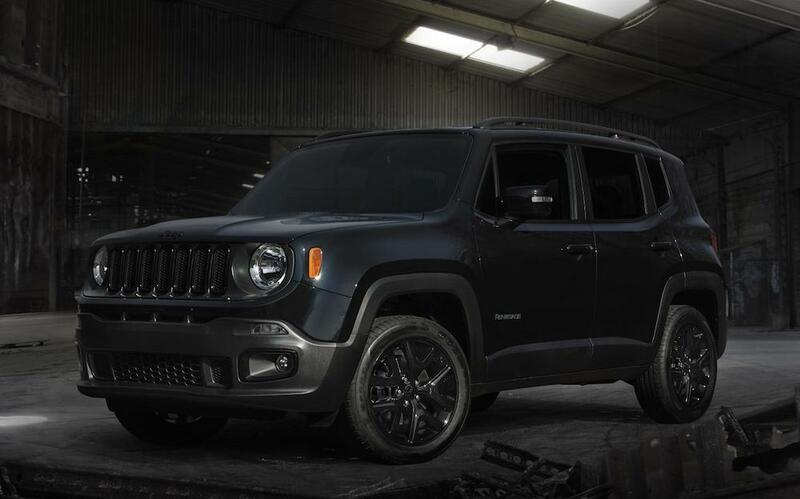 The post Official: Jeep Renegade Dawn of Justice Edition appeared first on Motorward. Following the launch of Cherokee Night Eagle, Jeep is now launching a version of the smaller Renegade model featuring the same treatment in the British market. 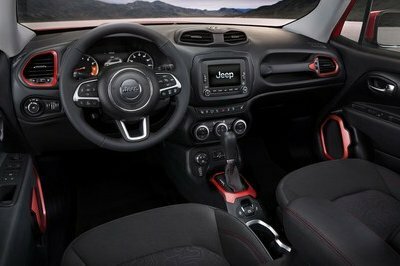 Jeep Renegade Night Eagle limited edition comes with exclusive interior and exterior appointments, and only in 160 copies. Although it tries, Jeep Renegade Night Eagle is not as cool as its big brother mainly because it has a weird design. Still, the Night Eagle treatment, with its Volcano Sand matt paint finish,17-inch black alloy wheels, rear parking sensors, satin grey Jeep badges and unique Night Eagle badge, coloured roof bars and side mirrors, and satin grey grille rings on a black front grille, does improve the looks of the small crossover. Inside the cabin, the limited edition benefits from exclusive seats in bark brown fabric with electric lumbar support for the driver, leather wrapped steering wheel, dual zone climate control, DAB UConnect radio with 5-inch touchscreen, Bluetooth and satnav, and cruise control. There’s also exclusive options, including electric panoramic sunroof, heated front seats and steering wheel, and regular size spare tyre. Jeep Renegade Night Eagle Edition can be ordered with one of two MultiJet II diesel engines, 1.6-litre 120hp with two-wheel drive, or the 2.0-litre 140hp unit with all-wheel drive. Prices start from £21,595 and £24,095 respectively. The post Official: Jeep Renegade Night Eagle Edition appeared first on Motorward. The 2015 Jeep Renegade is the youngest of Jeep’s lineup of SUVs and crossovers , having only made its debut in March 2014 at the Geneva Motor Show . 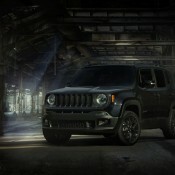 In short order, the Renegade has established a following, reflected by its strong sales figures. As of September 1, 2015, Jeep has moved 28,907 units of the Renegade in the U.S. alone. Jeep is again having transmission software woes related to the nine-speed automatic derived from the popular ZF eight-speed. This time, the issues surround the 2015 Renegade – Jeep’s version of the Fiat 500L and 500X. 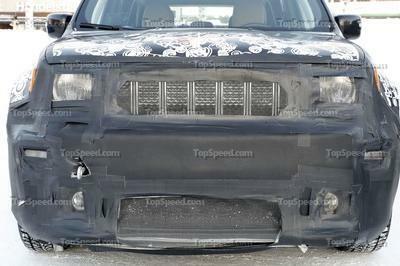 FCA had very similar problems with the Cherokee during its rollout back in 2013. And as before, the issues are keeping dealerships from receiving inventory. 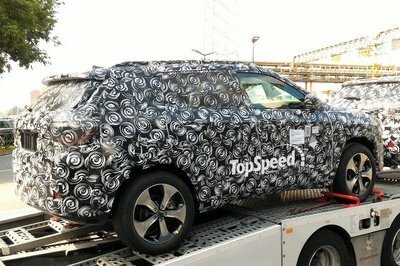 Jeep Renegade Withheld From Dealers Thanks To Software Problems originally appeared on topspeed.com on Wednesday, 20 May 2015 17:30 EST. Jeep’s newest SUV might not seem conventional to the rough-and-tumble brand, but after spending a week behind its leather-wrapped wheel, the 2015 Renegade proved to be all the things that embody the Jeep persona. It’s small in size, is available with a manual transmission and 4WD, and comes packed with tons of personality and throwbacks to its heritage. 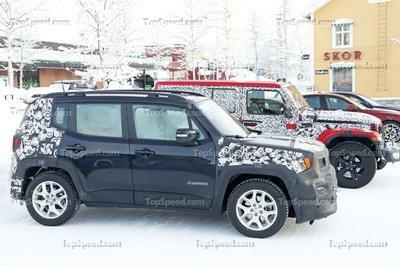 2015 Jeep Renegade – Driven originally appeared on topspeed.com on Tuesday, 12 May 2015 10:30 EST. 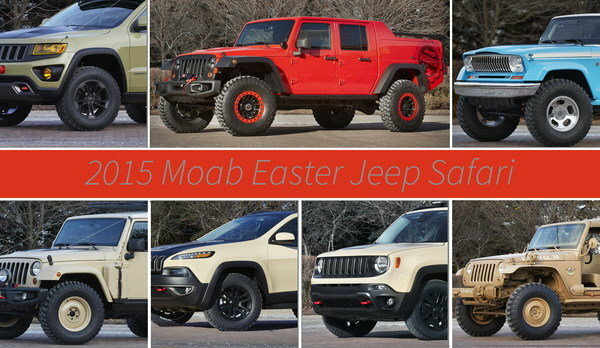 2015 Easter Jeep Safari Concepts tackle Moab: Video originally appeared on topspeed.com on Friday, 3 April 2015 14:30 EST. With a “Trail Rated” badge proudly affixed to its front fenders, the 2015 Jeep Renegade Trailhawk can already brag about its off-road prowess at the challenging Rubicon Trail to other cute utes it competes against. Now the Jeep Renegade Desert Hawk concept helps show off another potential use for Jeep’s all-new subcompact crossover with a beefed-up model that is ready to take on a desert adventure. 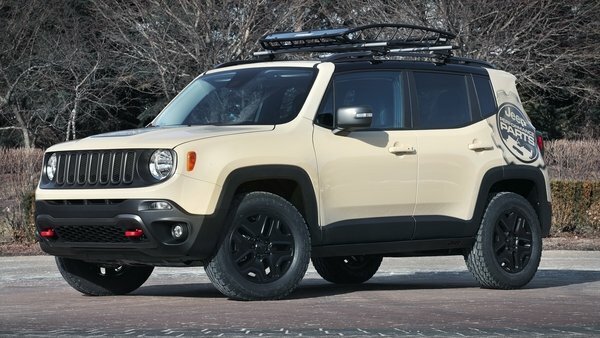 2015 Jeep Renegade Desert Hawk originally appeared on topspeed.com on Wednesday, 25 March 2015 09:30 EST. Every year Jeep pulls the covers off several concept vehicles just ahead of the Easter Jeep Safari held in Moab, Utah, and 2015 is no different. 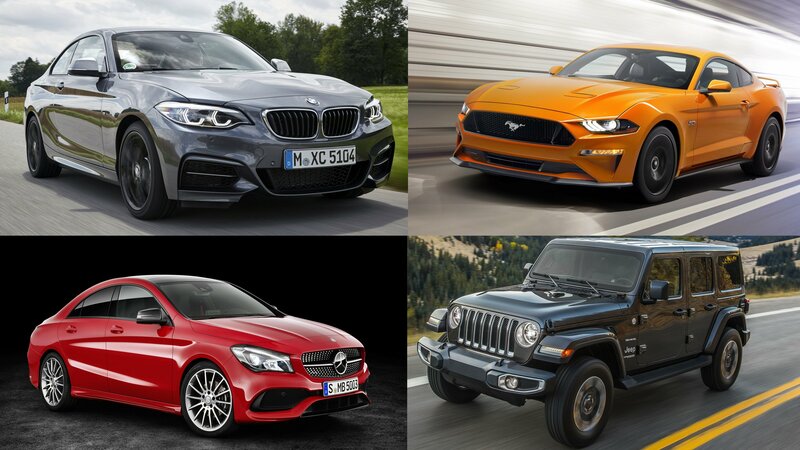 This year’s crop includes seven, fully custom Jeep vehicles from the new Renegade to the trusty Cherokee and Grand Cherokee siblings and of course the rough and tumble Wrangler. 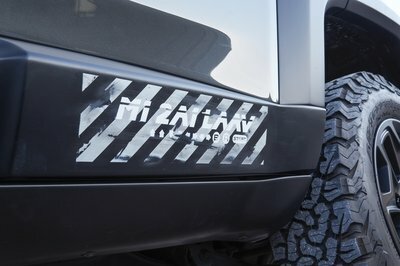 Jeep Reveals Seven Concepts For 2015 Moab Easter Jeep Safari originally appeared on topspeed.com on Thursday, 19 March 2015 13:30 EST. 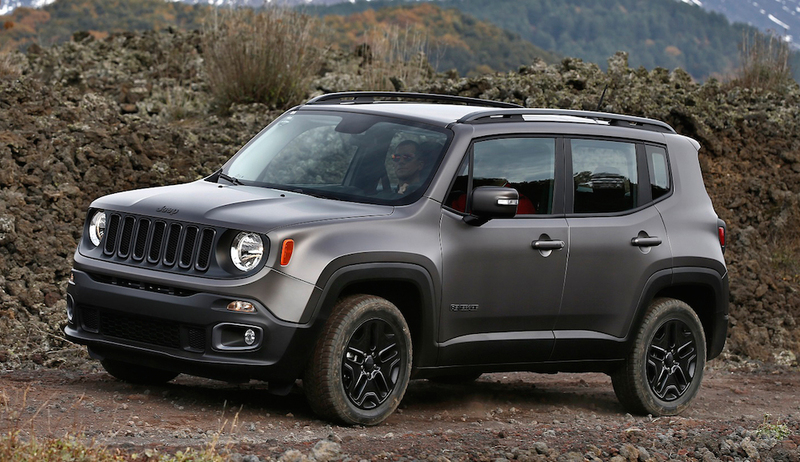 2015 Jeep Renegade Hard Steel Showcar originally appeared on topspeed.com on Monday, 2 March 2015 11:30 EST.